Good morning! Happily, more Easter decorating is going on around here! We host a big group on Easter Sunday so I plan ahead for weeks for my Easter table setting. Easter is such a happy time and also gets us excited about spring. Having been through several Easter mornings in the past where we were buried in snow, we are crossing our fingers again for a warm day. So are the kiddos that come over for our big Easter Egg Hunt! 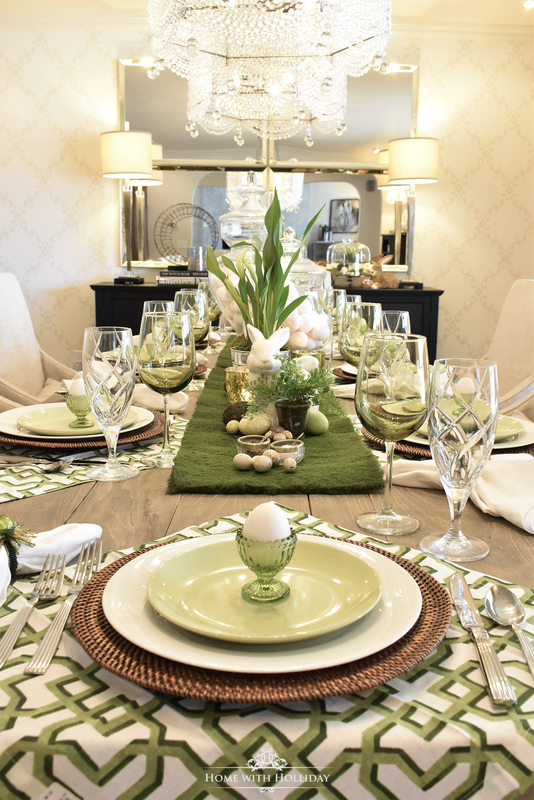 Today, I am sharing our Green and White Easter Table Setting for the big day. For Easter dinner, I like to coordinate all of my tables, but let them stand on their own with commonalities to tie them together. For the “big kid’s table” shown below (click here to see full post), I used a green and pink color palate. It was festive, but not too “young” looking for the teenagers. Heaven forbid! For the “adult table”, I envisioned a clean, fresh look so I settled on a green and white table setting. The green and white trellis napkins started it all off. I really like using napkins instead of placemats. Typically, they are less expensive than placemats and there are a lot more options available. Also, I like how they add interest to the table and how they fall over the sides of the table. I already owned the chargers and white plates. They are staples in my inventory. To keep costs down, I just made sure not to go crazy with the accents for the table. Example one…I found these perfect salad plates on clearance at IKEA for $0.99 each! Needless to say, I bought a bunch of them. The tiny, adorable egg holders came from Cost Plus World Market and were only $1.49 each. They come in several colors. And, the eggs…they are real eggs…so easy! The perfect accessory for any Easter table setting. My collection of white bunnies has grown through the years so that certainly made it easy to decide to incorporate white into this table setting. Plus, I used them on the centerpiece I made for our island (see the whole post here). Our annual function starts at 4 p.m., so it is still light outside for dinner so I liked the idea of a bright, but not too formal tablescape. Nothing here is too fancy. There is only one “fancy” feature on this table. Do you notice it in the photos? My son turns 17 a few days after Easter Sunday, so we also celebrate his birthday with our guests every year. He is not fond of the attention, but I guess that is how most teenage guys roll. 🙂 Anyway, I set one of my Waterford salad plates (given to me by my best friend, Jill, years ago…she knows me so well!) on his place setting for his birthday cake. Even though she still lives in Dallas, it at least feels like she is here in a small lovely way. I think of her and our amazing friendship every time I use them. Now, here a few money saving suggestions. First, I found the potted Calla Lilies at Trader Joe’s for $4.99 for my “big kid’s table” (shown earlier) and I thought they would also work great for this table setting. Plus, it ties the two table settings together. Bonus! You could use any spring potted plant for this. Based on the potted flowers being pretty small, I needed to come up with something a bit larger for the centerpiece. That is where the light bulb went off! Apothecary jars filled with eggs…real white eggs. 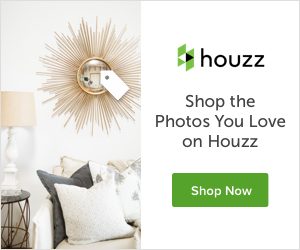 Super inexpensive! Plus, they could be used tucked in elsewhere on the moss table runner (also similar to the one I used in the breakfast room). The eggs can also be re-used and re-purposed. Fortunately, my daughter and husband both love deviled eggs! To finish things off, I just layered in a variety of speckled eggs, moss eggs, and the green votive candles. It is typical for me to coordinate other areas in my dining room with the design for the table. It is easy to do this by using similar colors and some of the same decorative items. For the buffet, I just added a few color-coordinated bunnies, moss and more eggs, etc. It is also hard for me to resist adding some Easter happiness to my bay window in the dining room. It was easy to do this by adding in a pillow and some accessories I gathered from other areas of my home that work with the table decor. This Mongolian Sheepskin Throw, that I have used in several areas of my home, was perfect. I purchased it from Cost Plus World Market (link below). It is a fantastic accessory to have. My 2 four-legged babies especially love it! Easter is such a blessed celebration for us. It reminds us all of the undying and merciful forgiveness that has been bestowed upon us. EASTER…Best. Story (truth). Ever! I hope you gleaned some inspiration for your own Easter celebration. I hope you have a glorious time with your own family and friends. I appreciate you stopping by to see our Green and White Easter Table Setting! Love it all! Thanks for sharing… and I love the ‘truth’ at the very end. He is risen! Thank you, Julie and thank you for stopping by! It is so nice to know someone is reading all the way to the end! 😉 Have a great weekend! I love it all. I just needed a pop of color and the trellis napkins did it. Thank you. I posted my pic on Pinterest. Thank you so much! I am so glad you liked it! I can’t wait to see what you did!! Wonderful table setting – every detail is beautiful! Warm and inviting…love the green anchor color too. may i ask where are your dining chairs are from? they add to the comfort of the room. Thank you for sharing! Thank you so much for your kinds words, Kathy! I am so glad you liked it! My chairs are from Restoration hardware and they still carry them. The super neat thing about them is that they have casters and make it so easy to move the chairs around! Have a great day! Having a tough time finding the egg cup holders. Will more stores carry them closer to Easter? This tablescape is beautiful! where did you find the green/placemats? Hi Angela! They are actually napkins that I turned diagonally for more interest. I bought them at Home Goods a year or two ago. However, in my latest post of green table setting ideas, I sourced several similar options. Here is the link…https://homewithholliday.com/2019/03/15/green-table-setting-ideas-20/ . I hope this helps!